Finland has set the course for a low-carbon and resource-efficient society and a sustainable economy. A key role in reaching this goal is played by a sustainable bioeconomy. Thanks to our plentiful renewable natural resources, high level of expertise and industrial strengths, Finland is excellently placed to become a pioneer of the bioeconomy in the world. The bioeconomy will boost the national economy and employment in Finland and enhance the well-being of the Finnish people. The vision of the first Finnish Bioeconomy Strategy is that Finnish well-being and competitiveness will be based on sustainable bioeconomy solutions. 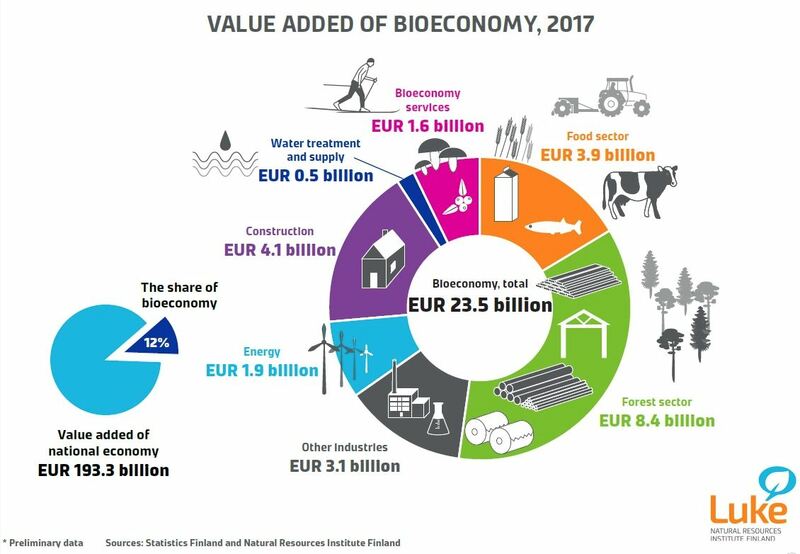 The objective of the Finnish Bioeconomy Strategy is to generate new economic growth and new jobs from an increase in the bioeconomy business and from high added value products and services while securing the operating conditions for the nature’s ecosystems. The leading idea of the strategy is that competitive and sustainable bioeconomy solutions for global problems will be created in Finland, and that new business will be generated both in the Finnish and international market, thus boosting the welfare of the whole of Finland. 4. Accessibility and sustainability of biomasses. Bioeconomy refers to an economy that relies on renewable natural resources to produce food, energy, products and services. The bioeconomy will reduce our dependence on fossil natural resources, prevent biodiversity loss and create new economic growth and jobs in line with the principles of sustainable development. The objective of the Bioeconomy Strategy is to push our bioeconomy output up to EUR 100 billion by 2025 and to create 100,000 new jobs. The Bioeconomy Strategy was drafted in a project set up by the Ministry of Employment and the Economy. Participants in this project were the Prime Minister’s Office, the Ministry of Agriculture and Forestry, the Ministry of the Environment, the Ministry of Education and Culture, the Ministry of Social Affairs and Health, the Ministry of Finance, the administrative branches under these Ministries, as well as VTT Technical Research Centre of Finland and the Finnish Innovation Fund Sitra. Stakeholders representing the bioeconomy also gave their inputs to strategy preparation.